Henry Wadsworth Longfellow was an American poet. He was one of America’s most popular poets during his lifetime and is considered one of the Fireside Poets. The Fireside Poets were a group of 19th century New England poets who were very popular among readers in the United States and overseas. The group’s name derived from the custom of families gathered around the fire at home reading the poems as a source of entertainment. Henry Wadsworth Longfellow is a descendant of Mayflower passengers Henry Samson, John Alden, John Howland, Richard Warren, William Brewster, and John Tilley. He also is a relatively close relative to a number of signers of the U.S. Constitution and the Declaration of Independence. These include Rufus King, Josiah Bartlett, Nathaniel Gorham and John Adams, the 2nd U.S. President. Other U.S. presidential kin include John Quincy Adams, Franklin Pierce, Gerald Ford, Ulysses S. Grant, Grover Cleveland, Zachary Taylor, Franklin D. Roosevelt, Calvin Coolidge, Richard Nixon, and both Presidents Bush. 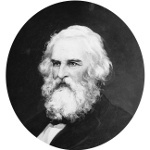 Fellow poets who are kin to Henry Wadsworth Longfellow include Ralph Waldo Emerson, Oliver Wendell Holmes, William Cullen Bryant, and Henry David Thoreau. Other literary kin include Louisa May Alcott, Louis Auchincloss, Clarence Day, Laura Ingalls-Wilder, Thomas Pynchon, and John Steinbeck. Some of the celebrities in his family tree include actor Richard Gere, Sports Illustrated cover model Hannah Davis, actor Henry Fonda, actress Shirley Temple, actor Humphrey Bogart, singer and songwriter Harry Chapin, actor James Spader, actor Zac Efron, and many others.